Details have emerged revealing the real reason why former Vice President Atiku Abubakar chose Peter Obi as his running mate. 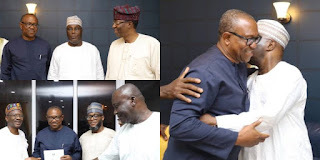 The Director General of the Atiku Abubakar Presidential Campaign Organisation, Otunba Gbenga Daniel yesterday revealed why former Anambra State governor, Mr. Peter Obi, was picked as the running mate to the presidential candidate of the Peoples Democratic Party (PDP), Alhaji Atiku Abubakar. In a statement last night, Daniel said Mr. Obi’s choice was largely influenced by his youthfulness, vast knowledge of global and local economics as well as being a financial expert, all experience which Nigeria is in great need of at this point in time. Investigation conducted by our correspondent revealed that the PDP leadership had presented some guidelines to Atiku on how to pick his running mate. A top source said: “Earlier on Monday, the PDP presented guidelines to Atiku and eventually, it was agreed that ex-Governor Peter Obi fits into the criteria set out. “The banking sector, which is the mainstay of the nation’s economy, will have a new lease of life with Obi in charge. “More importantly, the marginalization of the Igbo was one of the issues which PDP had promised to address. Responding to a question, the source added: “The nomination of Obi will foster the nation’s unity and create a sense of belonging for all tribes. “It is like a return to the winning formula of the defunct National Party of Nigeria (NPN) between 1979 and 1983. The ultimate objective of PDP is the preservation of the nation’s unity. At press time, it was gathered that a South-South governor could be appointed as the Director-General of the Presidential Campaign Organization of PDP for 2019 poll. It was learnt that the said governor is on the verge of completing his second term, a development which has narrowed the choice to Governor Henry Seriake Dickson of Bayelsa State. But consultations were still ongoing last night on the campaign structure. A reliable source said: “The thinking in PDP over the DG of the 2019 campaign is to pick a governor from the South-South who is almost completing his second term. “The idea of the President of the Senate, Dr. Bukola Saraki being the DG is out of place because he leads the National Assembly, which is a strategic arm of government. He has a lot at hand; we do not want to distract him or any of the serving governors. Although the source was not forthcoming, it was learnt that the Governor of Bayelsa State, Henry Seriake Dickson, might be appointed the DG. “Dickson played a key role in mobilising support and perfecting strategies which earned Atiku the presidential mandate, “ a member of th e National Working Committee of PDP added.